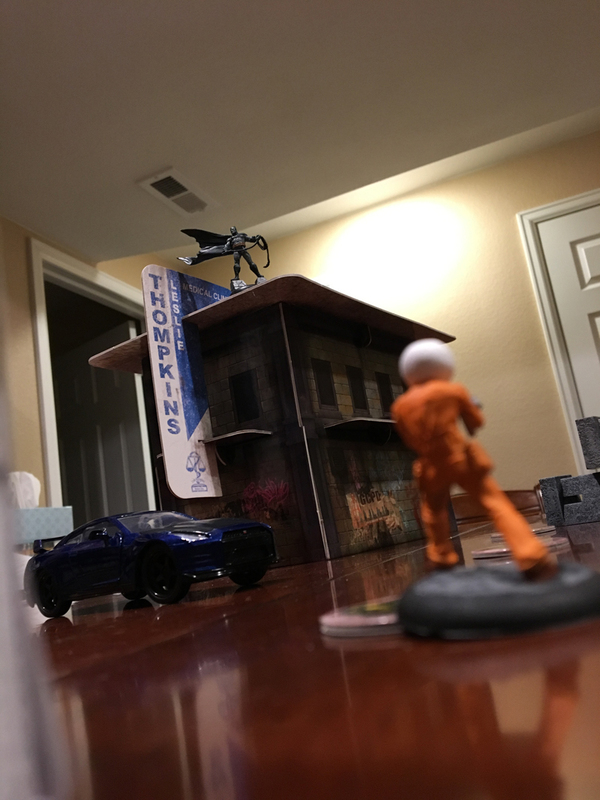 Well my friend and I pushed and we were able to get some paint on some models, slap together a “demo” squad of 150 reputation (“points” in this game), and get a learning game done. 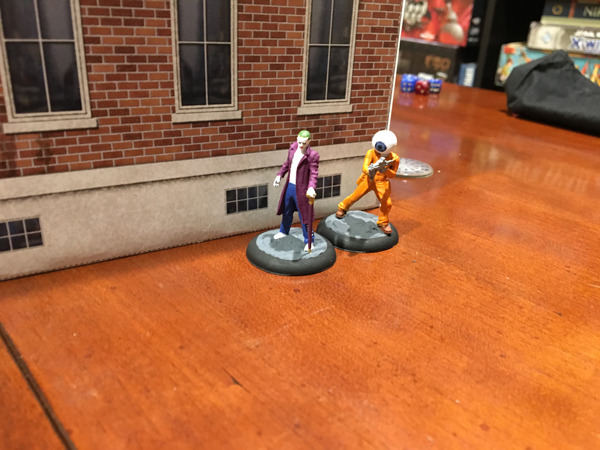 Above is my Joker (Leto) and Eyeball Man henchman team. Ready to take on Frank Miller’s Batman and some GCPD lackeys. 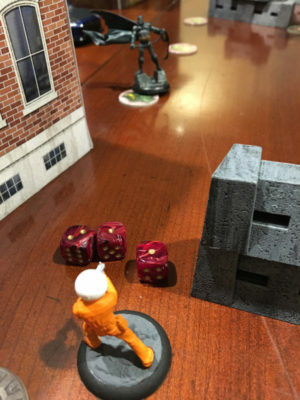 We set up an impromptu board and did the first scenario of the main game book: A Chance Encounter. 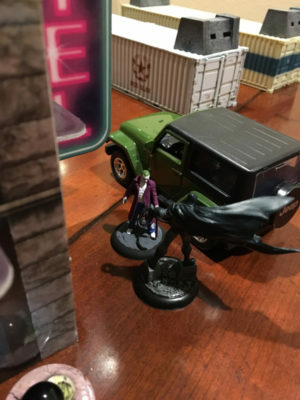 Gotham’s finest makes his way into the street, walking his normal beat. 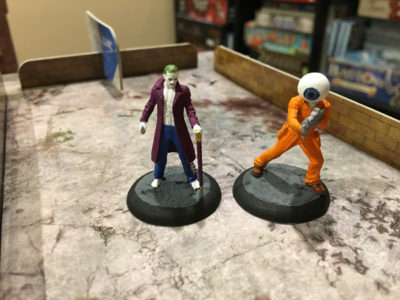 While Joker and Eyeball Man are on the prowl for a score. 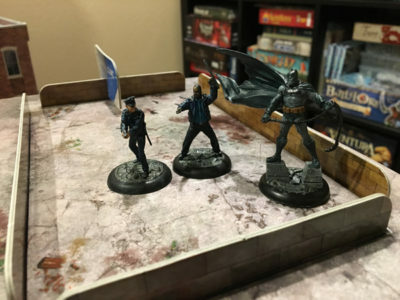 Gotham’s Finest finds a peculiar puzzle on the ground. Being an expert at the daily crossword, he quickly solves it not realizing that that puzzle was meant for the Joker himself. 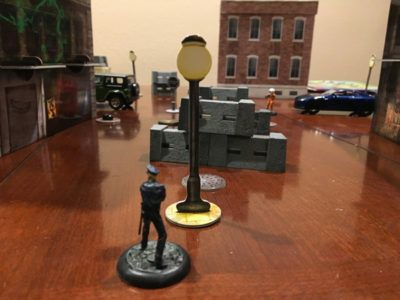 Eyeball Man jumps into action and sprays the officer for a couple of damage. …to watch Eyeball Man light up his comrade and knock him out in a hail of gunfire. 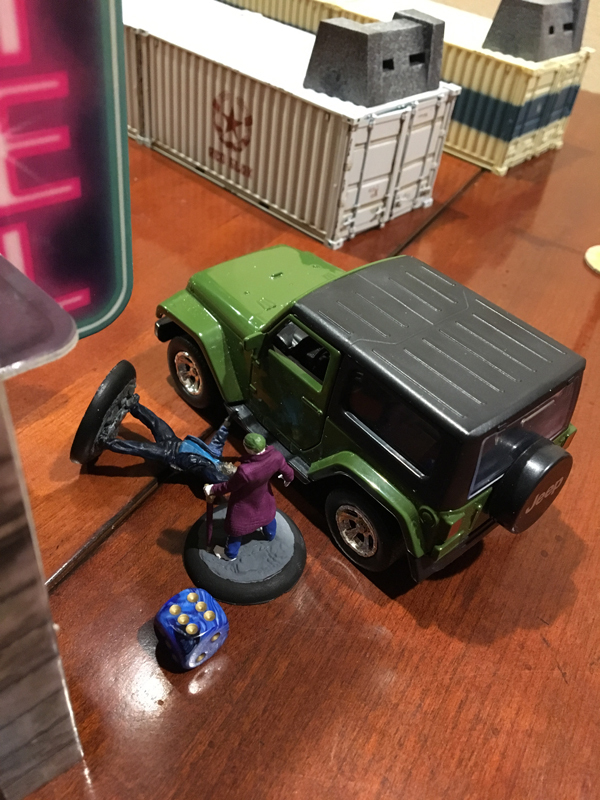 Joker, the sadistic thug he is, runs over and puts the poor officer out his misery. Batman arrives seconds too late. And in his haste, totally whiffs his first attack. 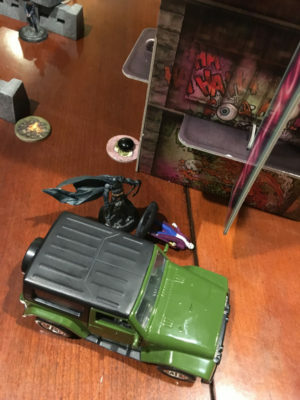 Surprised by the sudden appearance of the Dark Knight, Eyeball Man flees and opens up on Batman only to whiff as well. Batman then takes the fight to Joker and beats the hell out of him in one round. 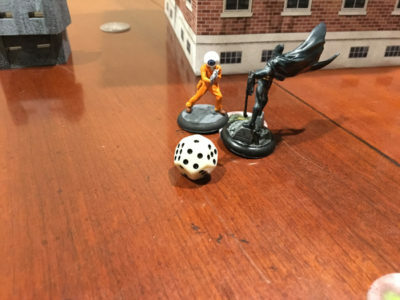 One more hit and the Joker is out, which will likely cause Eyeball Man to flee the scene. 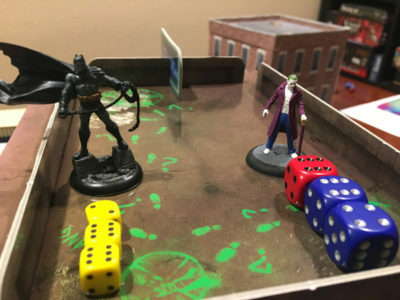 Winning initiative for the round let’s Joker dash up and run to the sewers to hide out the rest of the encounter. Batman isn’t through yet though and rushes Eyeball Man. Dealing exactly the justice this scumbag deserves, KO-ing Eyeball Man. 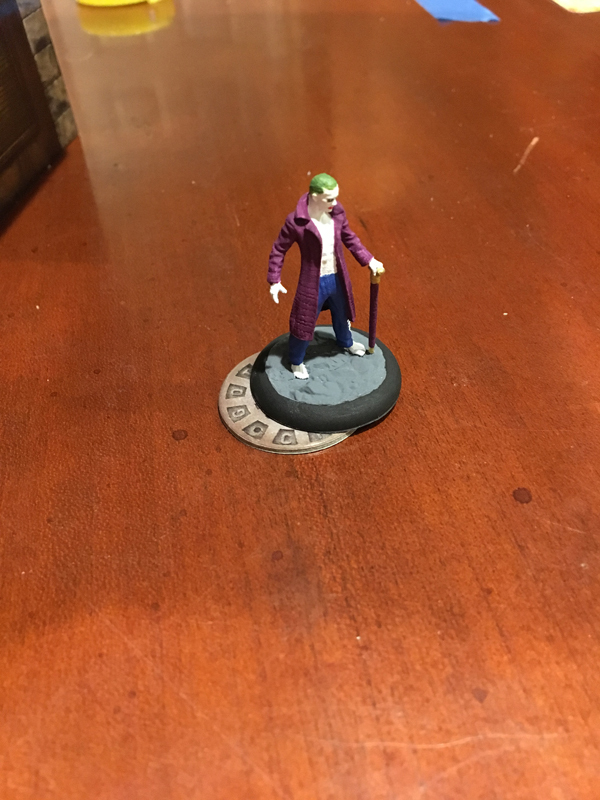 The night ends with one of Joker’s goons in custody but the big man himself is nowhere to be found. 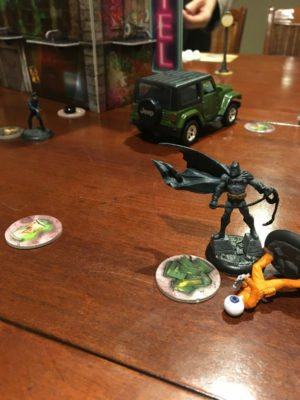 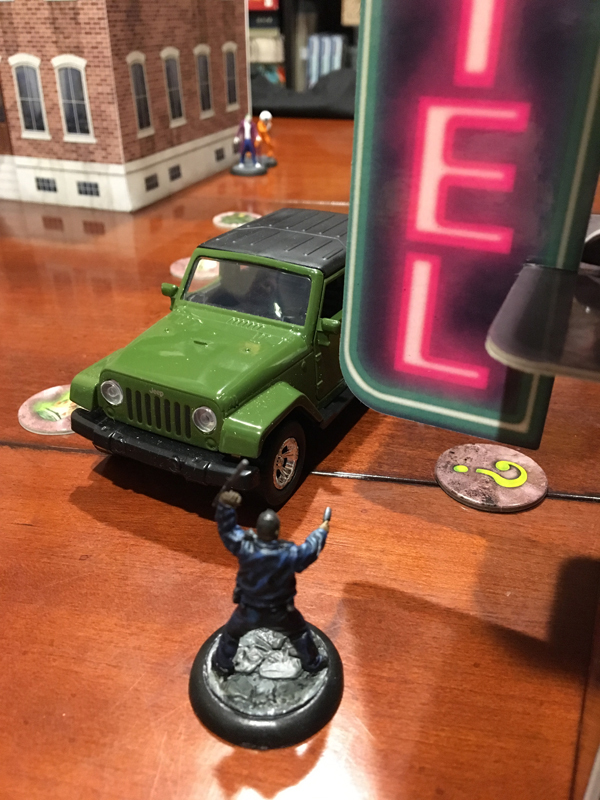 Unfortunately, that means it was too little, too late for Batman as Joker wins the round (14 VP to 12 VP) and continues on with his diabolical plan. 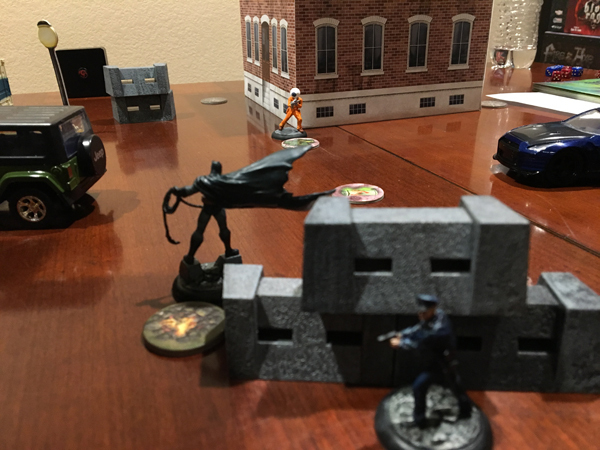 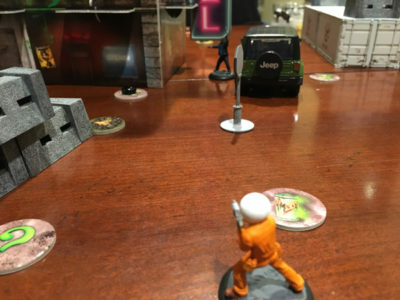 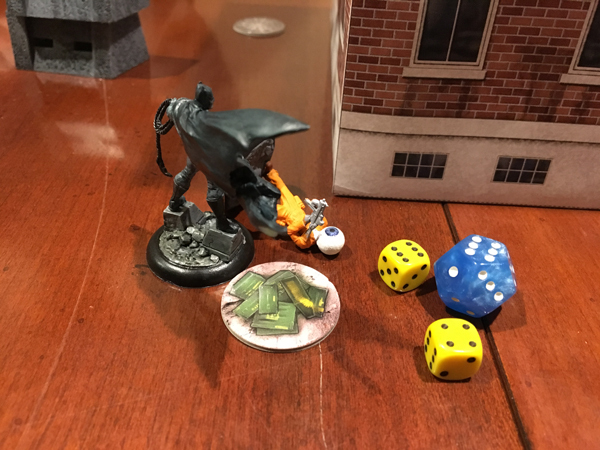 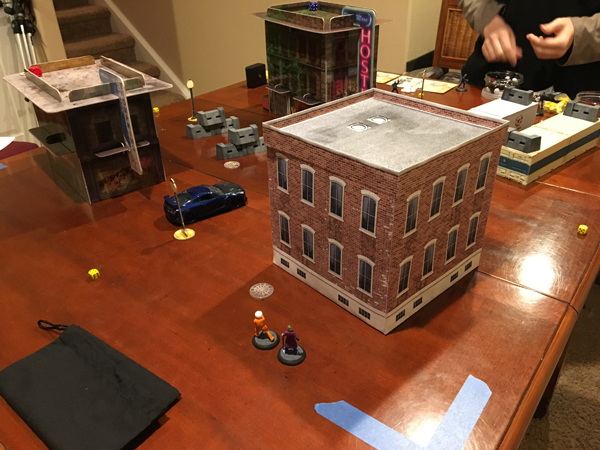 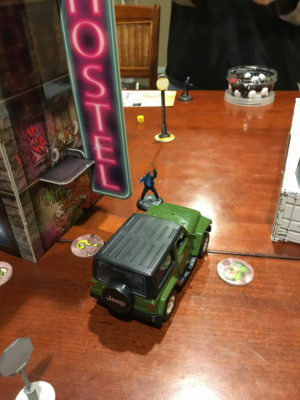 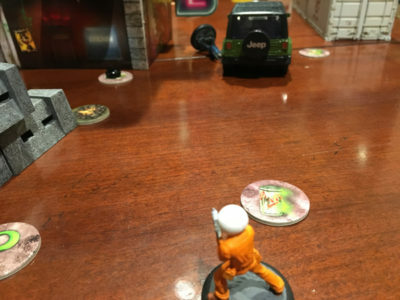 So a lot of great things in this miniatures game and we had a lot of fun. 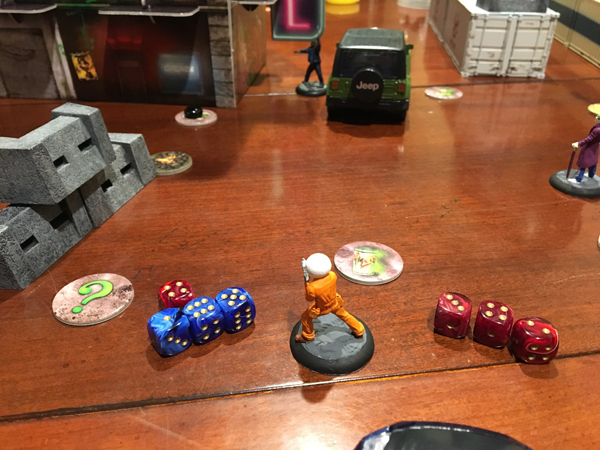 We totally messed up the first few turns forgetting that you can’t allocate more move counters to your character than their actual move value. This had our characters running all over the map in the beginning. We corrected it on about round 3 and things went smoother after that. 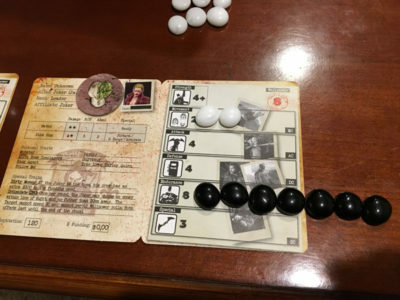 There seems to be a learning curve on this due to all the little keywords each character has so our game ran pretty long as we constantly were checking rules. This should get better as we play more and we’ll likely make better cheat sheets for next time. For next time, we plan on taking it simple and expanding our current force to 200 reps (points). 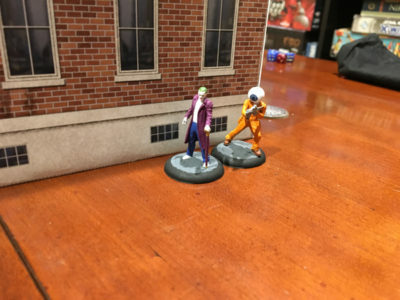 I’m already working on finishing up these two models and adding my third to get me close to 200.